I have a love-hate relationship with making apple pie. With this crust recipe I feel like I’m killing the people who are eating the pie (8 tbsp shortening + 12 tbsp butter per pie). It’s also pretty labor intensive since each layer of crust needs to be prepped ahead of time and rolled out delicately, and all those apples need to be peeled, cored, and sliced. I think I get annoyed because there isn’t really any way to scale this recipe up easily. The worst part is that you can pick up a frozen supermarket pie for $3, which is completely demoralizing. On the plus side, these guys look amazing and everyone’s impressed when you tell them that you made it yourself. The flavor of the pie is very good, though I’m still working to make the filling a little less wet. I always end up with leftover apples at the end too. I’ve made three of these so far, only for my family, and only over the holidays. Note that this makes a single crust. 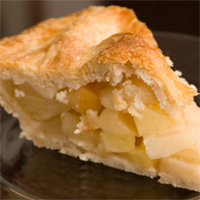 For the apple pie, double the recipe and split the dough in half before refrigerating. 2. Sprinkle vodka and water over mixture. With rubber spatula, use folding motion to mix, pressing down on dough until dough is slightly tacky and sticks together. Flatten dough into 4-inch disk. Wrap in plastic wrap and refrigerate at least 45 minutes or up to 2 days. 3. Adjust oven rack to lowest position, place rimmed baking sheet on oven rack, and heat oven to 425 degrees. Remove dough from refrigerator and roll out on generously floured (up to ¼ cup) work surface to 12-inch circle about 1/8 inch thick. Roll dough loosely around rolling pin and unroll into pie plate, leaving at least 1-inch overhang on each side. Working around circumference, ease dough into plate by gently lifting edge of dough with one hand while pressing into plate bottom with other hand. Leave overhanging dough in place; refrigerate until dough is firm, about 30 minutes. 1. Adjust oven rack to center position and heat oven to 425 degrees. 2. Peel, core, and cut apples into 1/2-to-3/4-inch slices and toss with 3/4 cup sugar and lemon juice and zest through allspice. Turn fruit mixture, including juices, into chilled pie shell and mound slightly in center. Roll out other dough round and place over filling. Trim top and bottom edges to 1/2 inch beyond pan lip. Tuck this rim of dough underneath itself so that folded edge is flush with pan lip. Flute edging or press with fork tines to seal. Cut four slits at right angles on dough top. Brush egg white onto top of crust and sprinkle evenly with remaining 1 tablespoon sugar, (omit if freezing unbaked pie, see below). 3. Bake until top crust is golden, about 25 minutes. Reduce oven temperature to 375 degrees; continue baking until juices bubble and crust is deep golden brown, 30 to 35 minutes longer. Transfer pie to wire rack; cool to almost room temperature, at least 4 hours. 4. Do-Ahead: Freeze the unbaked pie for two to three hours, then cover it with a double layer of plastic wrap, and return it to the freezer for no more than two weeks. To bake, remove the pie from the freezer, brush it with the egg wash, sprinkle with sugar, and place directly into a preheated 425 degree oven. After baking it for the usual fifty-five minutes, reduce the oven to 325 degrees, cover the pie with foil so as not to overcook the crust, and bake for an additional twenty to twenty-five minutes.